Sabine de Kerbriant (formerly Sabine Kerbriant de Lanvaux) first found the SCA in 1993, accidentally drawn in by the siren call of a friend saying "Hey, someone's dragging me to this weird dance practice thing and I want you to come too!" At the start of her SCAdian career she dabbled in a number of the classic activities, including heavy weapons fighting, fencing, and embroidery, and quickly learned not to mess with anything involving sharp points and/or long strings. Her primary interests are music (current favored instruments include gemshorn, rauschpfeife, crumhorn, recorder, and transverse flute), poetry and literature, manuscripts and early printed books, commedia dell'arte, dance, and archery, but she can easily be distracted by any interesting medieval or Renaissance art form -- especially the tasty ones. She is particularly fond of all things French. Sabine has served as a baronial officer of one sort or another since 1995 (including a five-year tenure as Baroness of Bhakail), has been director of the Bhakaili Branslers since 2007, and enjoys calling herself patroness of the commedia troupe I Zanni Illuminati. King Edward III and Queen Thyra II inducted her into the Order of the Laurel at 12th Night in Carillion on January 17, 2015, and Queen Anna III and Princess Honig named her Queen's Bard at the East Kingdom Bardic Championship in Concordia of the Snows on February 11, 2017. Persona-wise, Sabine comes from minor Breton nobility somewhere vaguely circa 1300. She was fostered in a Parisian branch of the family, eventually becoming a lady-in-waiting to Dorren of Ashwell, an English baroness on pilgrimage. She spent some time receiving musical tutelage from first Maitresse Linette de Gallardon and then Magistra Rufina Cambrensis; more recent escapades are entirely her own fault and should not be blamed on any reputable musicians. Sabine is married to Baron Nissim Aven Darmon, called Darmon; their daughter Isabelle, born in 2007, was known as the Marquesa of Black Icorndall from 2008-2013. She and her family are members of Dar Nafoura Hajjar (House of the Stone Fountain). 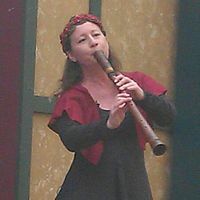 Together with Margreþa La Fauvelle, once her first apprentice and now a sister Laurel, she performs as part of "Rondelay Music". Her second apprentice is Lady Solveig Bjarnardottir, and her current students are Baroness Suba al-Hadid and Juliana Bird (a.k.a. Bird the Bard). This page was last edited on 10 December 2018, at 19:24.